The Painted Hills, as well as other spots in the gorgeous and historically-significant mountainous areas of Wheeler County, Oregon, contain countless trails for the perfect hike of any length and difficulty. We love the region so much we’re the Find Your Unknown trailer is heading there this July—read on to find out more! In Wheeler County, adventurous travelers will find one of the Wonders of Oregon: gorgeous countryside rolling through mountains and hills that are perfect for day trekking throughout the year (though we recommend morning hikes in late summer for the best weather). 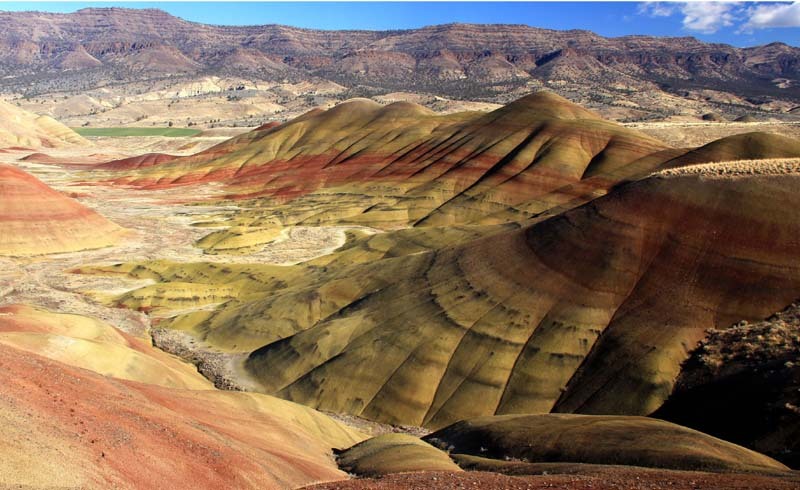 Most notable are the day hikes in the Painted Hills, named for the layers of gorgeously colored soil in reds, blacks, and golds. This area of Oregon has paleontological significance—the fossils of early horses, camels, and rhinoceroses have been found here in abundance. 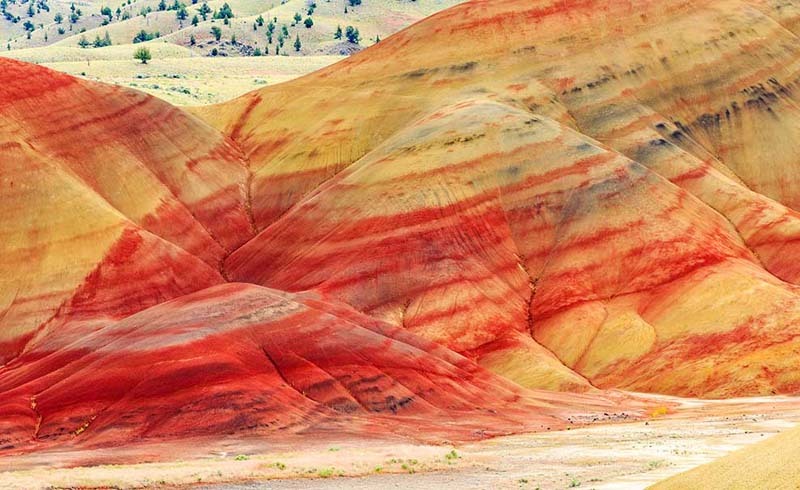 The Painted Hills are just one unit of the John Day Fossil Beds National Monument, a federally-protected area of shrubbery, rivers, streams, and badlands that are rich in beauty as well as historical significance. Of the top places to hike in Wheeler County, the Painted Hills are just one option—here are all the details to truly enjoy the best of Oregon’s nature. Strawberry Mountain provides a long, difficult hike for the trekker looking for a real challenge. It’s over 12 miles (19.3 kilometers) long, and escalates more than 3,000 feet (914.4 meters) in elevation. Crowds are common where the hike begins at Strawberry Lake, but it thins out quickly. And making past the crowds is worth it because the hike’s a beaut: It features a waterfall and exquisite fields of wildflowers before traveling up the mountain’s east slope, completing a total of nine switchbacks. There are shortcuts, but staying on the trail preserves the mountain’s delicate ecosystem. Since the hike is challenging, pack wisely with a lightweight daypack like the Expanse Hauler Duffel, which is large enough to hold water, snacks, sunscreen, a first aid kit, and other necessities. There are seven smaller hiking trails in the Sheep Rock unit of the National Monument. In the Foree Area, beginning hikers will enjoy the Story in Stone trail, which is only 0.3 miles (0.5 kilometers) round trip, and which has been the site of fossil finds from 25-30 years ago. In the Blue Basin Area, a moderate/difficult hike can be found in the Blue Basin Overlook, a recommended and enjoyable 3.25-mile (5.2-kilometer) loop. The trail is dusty, and wet weather can turn aforesaid dust into a muddy soup, making things impassible, so be sure to wear waterproof boots and use a water-repellent daypack. The reward for braving the 600-foot (183-meter) elevation gain is a stunning view of the John Day River Valley and sweeping views of Grant and Wheeler Counties. And these are only a sampling of the many, varied trails found in this unit! There’s more for the hiker keen to truly dive deep into Sheep Rock’s many hiking trails. The dramatic cliffs of the Clarno Unit of John Day National Monument are some of the least visited, but indisputably gorgeous and well worth the hike for anyone interested in seeing the truly best of Wheeler County. Arch Trail is half a mile long and climbs to the base of the Palisades. It is a steep walk, marked by a delicate stone arch at the end. The Trail of Fossils is a quarter mile, and leads through a field of boulders. Amidst the fallen rocks are leaf and wood fossils, and looking for them is an excellent diversion. And then there’s the Geologic Time Trail, which connects the other two trails and, at the end of a half-mile hike, provides beautiful views of the spires of the Palisades. Keep the camera handy in a fanny pack —trust us, it’s needed! And of course, the most popular hiking spot in Wheeler County: The Painted Hills. This unit consists of five short hikes, many of which can be chained into combinations allowing for a greater view of the scenic mountainside topography. The Carroll Rim Trail is 1.6 miles (2.4 kilometers), with a 400-foot (122-meter) elevation, that ends in a panorama of the Painted Hills. The Leaf Hill Trail is 0.25 miles (0.4 kilometers), and has been thoroughly excavated and studied by archaeologists over the years. The finds are explained in signage on the trail. Also notable is the Painted Cove Trail, which shows off some of the spectacular coloring of the Painted Hills, with a boardwalk partially covering sensitive soil. If you’re hiking the Painted Hills or other areas of Wheeler County this July, the Find Your Unknown trailer is cruising around the region and we’d love to see you. Check out our Instagram for more information!